A four day conference from January 22- 25 brought together stakeholders from the financial institutions, policy makers, project developers and was sponsored by the Nigeria Economic Summit Group (NESG). 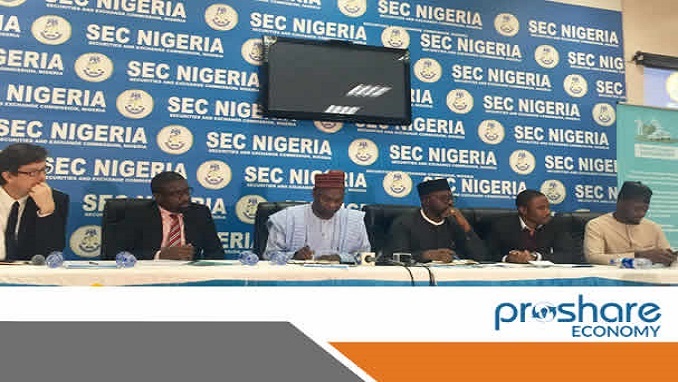 The day at the Securities and Exchange Commission (SEC) served as the final day for the highly informative and enlightening programme. Giving the opening remarks, Mr Isyaku Bala Tilde Ag. Executive Commissioner (Operations), who represented the Acting DG SEC, said the four day workshop would make the Nigerian investment environment better. He said that climate will be addressed as a key priority in the ten-year capital market master plan developed by SEC. Mr Tilde further stated that projects with high positive environmental impact will be embarked upon going forward in the Nigerian economy. Highlighting the achievements in line with this so far, he said the committee has received two applications worth N25 billion, one of which has been approved by the committee and the second one is at the final stage of processing for approval. Talking on partnerships he said that the commission is making efforts to partner with several other organisations to promote co-financing. On addressing the benefits of the CFA to Nigeria, he said it will push national aspirations for more inclusive economic growth. The Chairman of the Committee for the UK-Nigeria CFA sessions Mr Kyari Bukar applauded Nigeria for the exceptional progress in the area of capacity development and sustainability. Mr Bukar, who was the former Chairman of the Nigeria Economic Summit Group, NESG gave insight on the activities of the four day workshop and how the investors, bankers, and government have looked at news ways of financing upcoming and existing projects within the course of the workshop. Introducing the CFA and context setting for project presentations Mr Chris Dodwell Senior Director, Ricardo Energy & Environment facilitators of the Climate Finance Acceleration initiative, highlighted the creativity brought forward by the project and the positive attitude brought to bear by the banks, namely Access, FCMB, Sterling and Union bank. Speaking further he said that green bonds need projects to invest in and awareness should be created to develop more project ideas. Dodwell said that the initiative was promoted by the private sector to bring policy makers, project proponents and investors together. In essence it is an international public-private collaboration. He said that there is a big role for the Nigerian government to play in the area of creating the enabling environment to attract real-time investments. Dodwell summarized the four day event, describing it as profitable even as several teams discussed green projects and grant funding. The program explored how to move Nigeria’s green economy forward. In his speech, he said the CFA is a strategic value chain and the future of climate change in Nigeria and financial enterprise.